Introduce your children to the Bible at an early age. There are many children’s Bibles, teen Bibles, and study Bibles. Let them see you reading, studying, & praying the Bible. Let the know that not only is it a good guide book, but it is also a love story from God Himself. It is a story of our salvation, and yet, so much more. It can bring us consolation & comfort when we are lost and uncertain. On the publication of the Catechism of the Catholic Church by John Paul II, he wrote: GUARDING THE DEPOSIT OF FAITH IS THE MISSION WHICH THE LORD ENTRUSTED TO HIS CHURCH, and which she fulfills in every age… The Catechism of the Catholic Church … is a statement of the Church’s faith and of catholic doctrine, attested to or illumined by Sacred Scripture, the Apostolic Tradition and the Church’s Magisterium. I declare it to be a sure norm for teaching the faith and thus a valid and legitimate instrument for ecclesial communion. May it serve the renewal to which the Holy Spirit ceaselessly calls the Church of God, the Body of Christ, on her pilgrimage to the undiminished light of the Kingdom! Oh yes, example! The most obvious, but one we often forget about… We might think our children aren’t paying attention to us, or think we are “uncool,” or out of touch, but just wait, all the sudden, they will say or do something, & that alarm will go off in your head:”That’s me talking!” As parents, we do have an influence. Let’s try to make sure we are modeling the behavior, actions, choices we want our children to imitate. Come Holy Spirit, help us to guide our children & all those we meet along the path of true Life, Love, & Happiness! 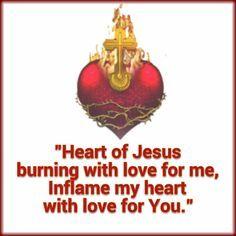 The Church celebrates the Feast of the Sacred Heart of Jesus….In July. However, as we approach the over commercialized Valentine’s day celebration, I encourage you to take a quick look at True Love. 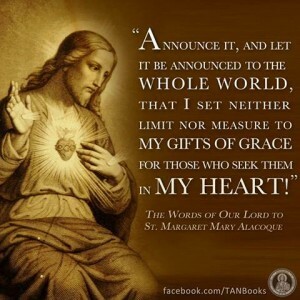 Why do we celebrate the Feast of the Sacred Heart? Because the Church continually mirrors in Her life the natural ebb and flow of our human lives. As we seek to mark those special moments in our own lives with special days, such as Anniversaries, etc., so the Church wants us to pause & reflect on the great love that Jesus has for us. As we typically give & receive gifts on these occasions, so Jesus seeks to give us the gift of His grace, His life, His love…. However, we know that, as in life, we need to acknowledge, feel, and return love on a regular basis. So, instead of waiting until July, let us look now at the Love of God. I would like to share with you a beautiful thought taken from One Bread, One Body. This beautifully illustrates God’s great love for us – each of us – individually. Don’t doubt that you are loved. You are loved greatly! One of the most beautiful – and disappointing – verses of the Bible is: “God is Love” (1 Jn 4:16). We all want to be loved, but we don’t necessarily value being loved by Someone Who by His nature loves everyone. We want to be loved exclusively, individually, and specially. If someone told you “I love you,” you would probably be impressed. If that same person repeated this to everyone, you may not be so impressed. However, God loves everyone – not generically, but individually and specially. This is impossible for us to do or even conceive. Yet “nothing is impossible with God” (Lk 1:37). God created us as unique individuals. He knows everything about us. He remembers every word, thought, and action we have ever said, had, or done. He has numbered the hairs of our head (Mt 10:30) and even counted every tear we’ve ever shed (Ps 56:9). God’s individualized knowledge of each of us indicates His individualized love for each of us. When we speak of the Heart of Jesus – we are speaking of God Who is Love. Take time today to celebrate God’s love for you – & in turn, take time to love God in return – He gifts us with His grace. What is your gift back to Him? Take a few moments every day this week, to grab your Bible or open your Bible app. Pray to the Holy Spirit to show you how God is speaking to you today, right now, as an individual who is uniquely and specially loved. God is love & He loves you like no other. Let us do honor to Christ’s baptism and celebrate this feast in holiness. Be cleansed entirely and continue to be cleansed. Nothing gives such pleasure to God as the conversion and salvation of men, for whom his every word and every revelation exist. He wants you to become a living force for all mankind, lights shining in the world. You are to be radiant lights as you stand beside Christ, the great light, bathed in the glory of him who is the light of heaven. The Baptism of Jesus invites us all to recall our own baptism & the necessity of Baptism. “Go therefore and make disciples of all nations, baptizing them in the name of the Father and of the Son and of the Holy Spirit, teaching them to observe all that I have commanded you” (Mt 28:19-20). We become children of God. We share in God’s diving life. We are also made priests, prophets, and kings like our Lord Jesus Christ. As priests, it is our duty to lift up to God our prayers and the prayers of our brothers and sisters. As prophets, we are called upon to proclaim the truths of the Gospel whether it is convenient or not. 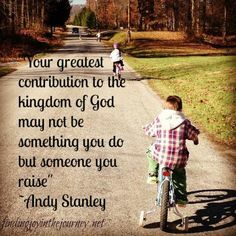 As kings, we have the responsibility to be good and trustworthy stewards of God’s gifts to us. We made a profession of faith in the Triune God and a commitment to reject sin. As we remember the baptism of Jesus, let us pray to him to grant us the courage to face life with vigor and with eagerness to fulfill our vocation as Christians. Let us remain true to our baptismal commitment of living truly and loving endlessly. and your voice proclaimed from heaven, ‘This is my beloved Son.’ Grant that we, who by water and the Holy Spirit are your adopted children, may continue steadfast in your love. Amen. In the United States celebrated on Sunday, January 6, 2019. 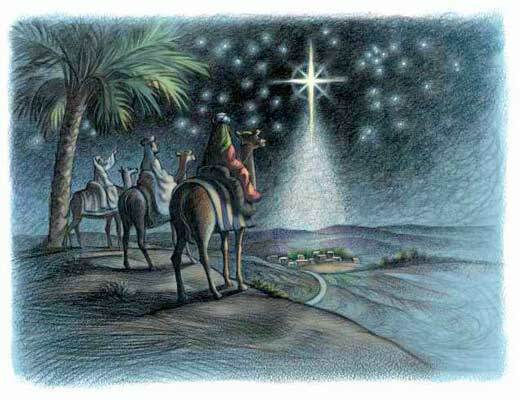 Let us be like the 3 Wise Men who journeyed to Jesus. Now, like those Wise Men, we return to the world from which we came, to the everyday life where we will witness to what we have seen. A good resolution for 2019: Am I a “wise man/woman?” Do I act – in thought, word, & deed, like one who has seen the Lord? Having seen, do I seek to invite others – in whatever way I can – to find Christ, Who truly is the Way, the Truth, & the Life? All of us! Let’s Plan how we can celebrate, live, & share the Word in 2019! The following is a list of the dates of the Holy Days of Obligation in the United States for 2019, as well as the dates of moveable feasts (holy days whose dates change from year to year). “…we are like the 3 Wise Men who journeyed to Jesus. Now, like those Wise Men, we return to the world from which we came, to the everyday life where we will witness to what we have seen. Merry Christmas! Are you testifying to the love, joy, & peace of Christmas? If we want people to appreciate & understand the true meaning of Christmas, we must live it. Thank you for your witness! In those days a decree went out from Caesar Augustus that the whole world should be enrolled. This was the first enrollment, when Quirinius was governor of Syria.So all went to be enrolled, each to his own town. And Joseph too went up from Galilee from the town of Nazareth to Judea, to the city of David that is called Bethlehem, because he was of the house and family of David, to be enrolled with Mary, his betrothed, who was with child. While they were there, the time came for her to have her child, and she gave birth to her firstborn son. In the Gospel of Christmas Eve morning, we hear the Zechariah prophesying in the power of the Holy Spirit. He is speaking of going before the Lord to prepare His way. 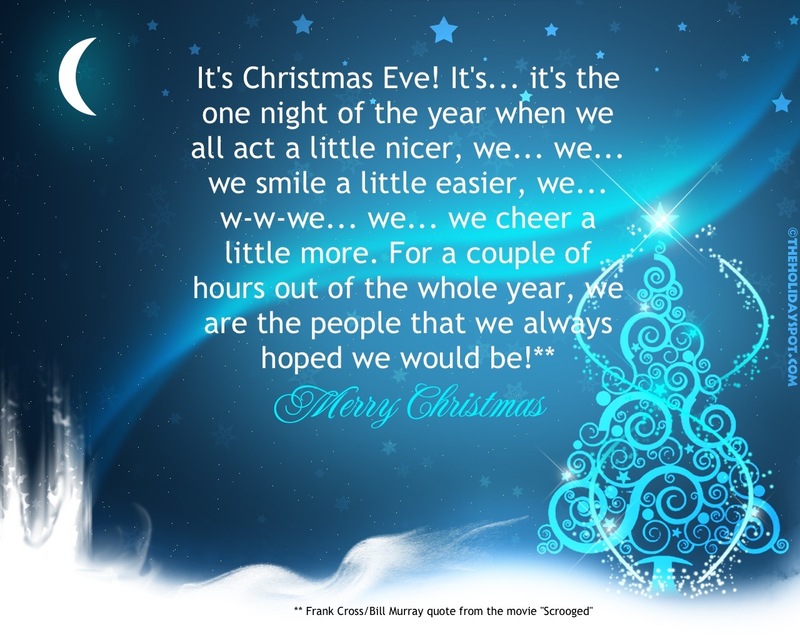 The picture I chose for Christmas Eve, reminds us that people are still open to the message of Christmas. As messengers of Christ, we know He is coming. We know that Christ still comes today. Knowing this, we can encourage others to be nicer to smile more, to offer joy and happiness to others. As our last Advent Action: Let us make a special effort to smile and offer a small prayer for all those we meet today. Let us be that kind smile, especially for those we might encounter while we are out. Everyone is looking for hope, love, and joy. Let us go before the Lord and prepare His way with our loving acts of kindness! 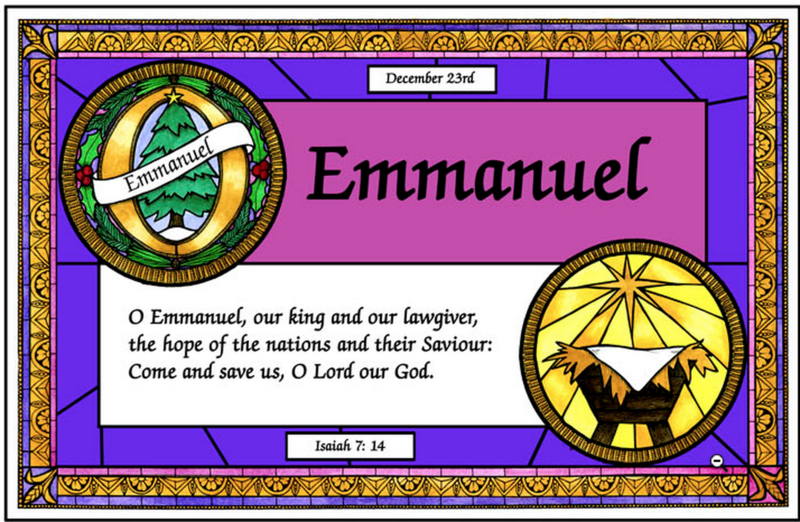 Advent Action: Take time to reflect on how God is with you. Take time to reflect on how God has come to redeem us; reflect on how He is with us daily, not just at Christmas; reflect on how He will come at the end of time… Are you ready? The coming of Christ is fast approaching… The Church offers us many opportunities & resources to prepare. Have you taken advantage of any of them? Confession? Daily Mass? Online Meditations? Scripture? Outreach Programs to those in need? Advent Action: If you have not gone to Confession, go. If you have not taken time to pick up your Bible and read a few verses, pick it up. If you have not done a random act of kindness for someone as a special birthday gift for Jesus, do a random act of kindness. Be prepared for the coming of the King of Nations. Come, Lord Jesus!